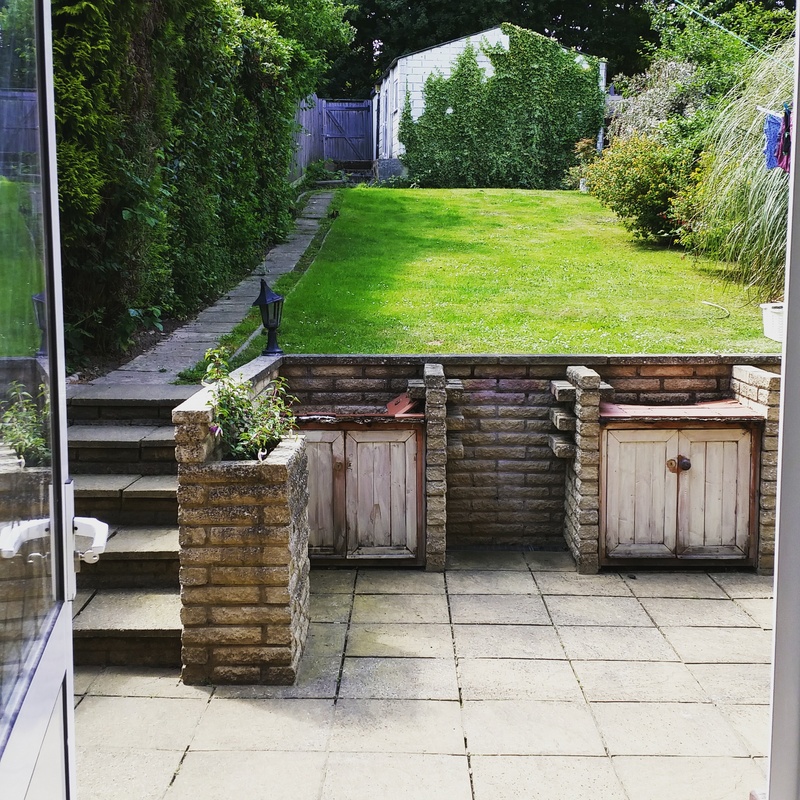 There hasn’t been much focus on our garden since the blog began, mainly because we look out of the window, look at each other, and wonder what on earth we’re going to do with it. For now it’s just “there” but this year we’ve both been a little bit more committed to trying to keep it looking tidier. 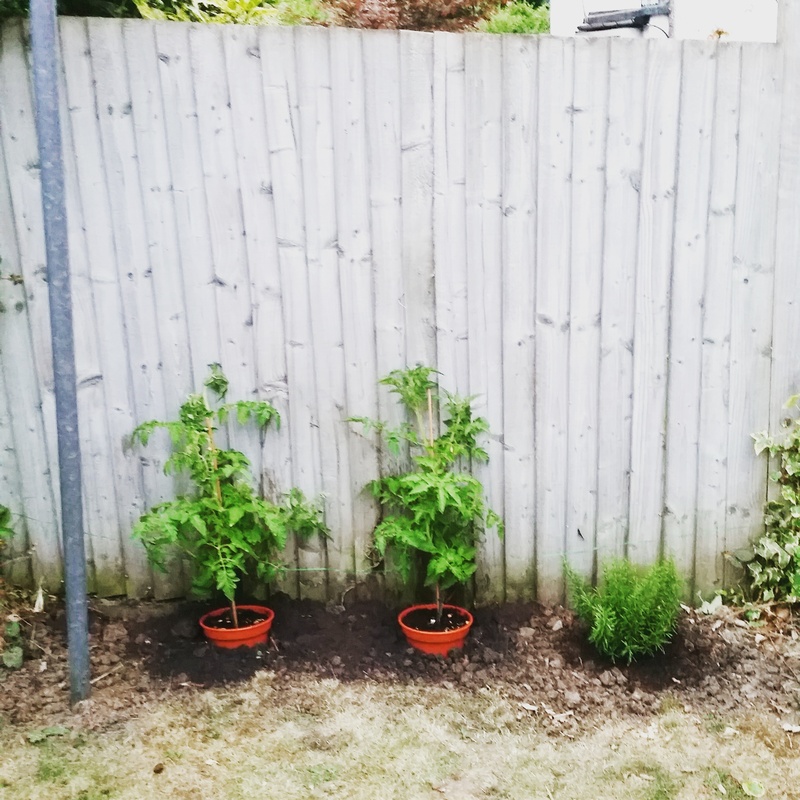 A few weeks ago, one of the other residents on our estate offered up some little tomato plants for free via the residents Facebook group and I took a couple, wondering if it might be possible to actually grow something instead of destroy it which is how most of my green-fingered attempts end. After repotting them, they stood on top of a cupboard in the garden in a nice sunny spot and away from all the slugs, loosely tethered to a cane to help them grow. It didn’t take long for them to need a new home and my colleague who is very clever at growing things said I could keep them in the pots but really they needed to be grown against a fence if possible, to give them a supporting structure and direction. 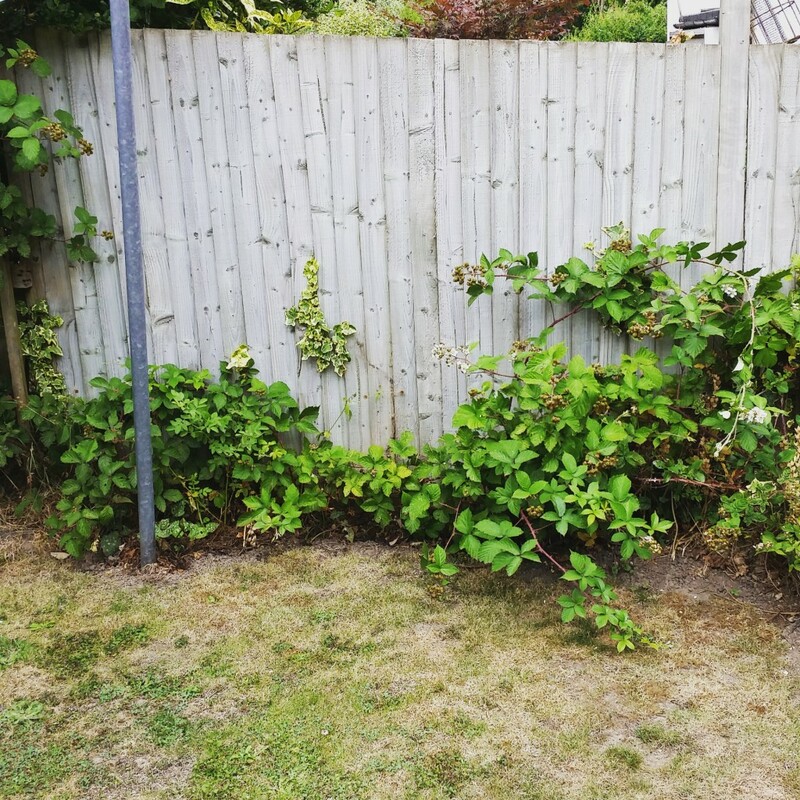 There was only really one part of the garden that they’d be safe without being swamped by other bushes and plants but it was smothered in brambles so one evening after work I dug deep and spent two hours clearing the area, creating a little space for the two tomato plants plus a rosemary bush. Not only does this little patch of garden look much lovelier now but the tomato plants are thriving and there’s even the first hint of tiny tomatoes growing! I must get some feed for them because the leaves at the bottom of the plants are turning a bit yellow which my good friend Google tells me is to do with either over-watering or not enough nutrients in the soil or both. How green are your fingers? Any tips for my tomato plants? I’m doing tomato plants for the first time this year too! I have them in my my back porch, which is a bit like a greenhouse. 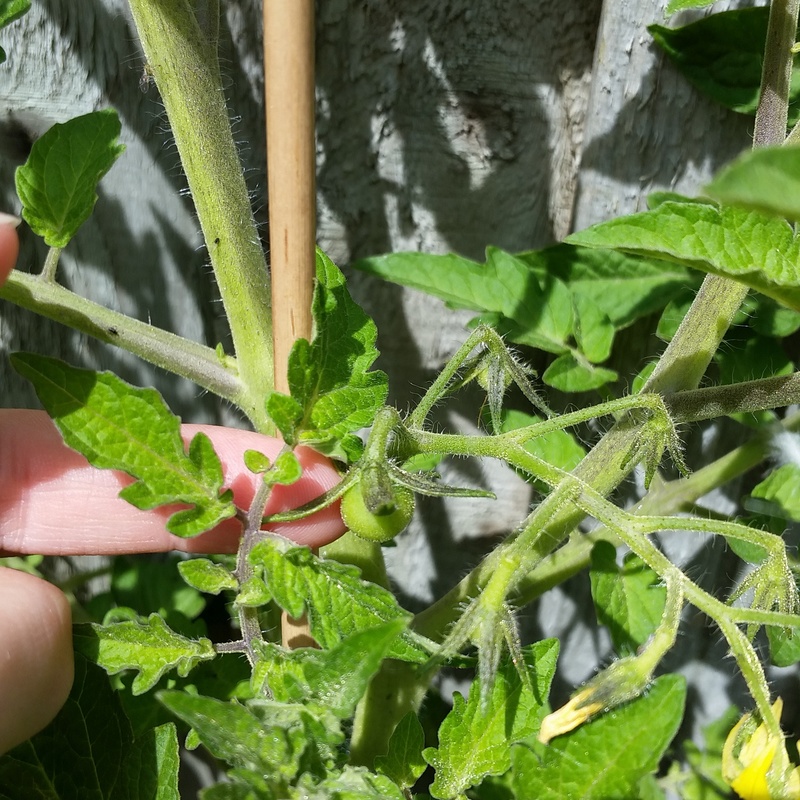 They’re very tall, but so far only two tomatoes! If you want an easy, low-maintenance option for your garden you could just try lots of lovely flowering shrubs. 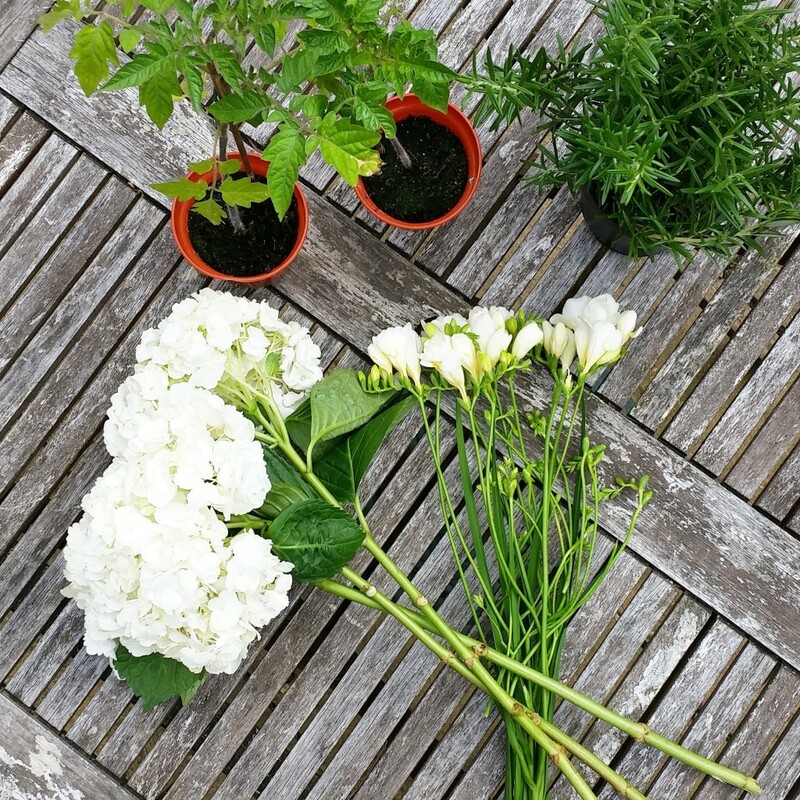 Ooo, get you, Mrs Green Fingers! I’m the kiss of death for fruit and vegetables. Nothing grows for me that’s actually edible. I’m just getting to grips with flowers but tomatoes might be a stretch too far. I have made my first attempt to grow something this summer too! My 9yo went on a school trip to a farm and came home with 3 pea seeds planted in a tiny pot. We lovingly raised them until they were big enough to go outside and then re-potted them in a larger pot in the garden. A few months later, our boy has just eaten his first crop of peas for dinner! He was so excited when he saw them grown and ready to pick and announced that he couldn’t believe he had grown them ‘all by himself!’ I didn’t like to mention that I had been outside watering them every evening for the last 3 months! Good luck with the tomatoes! Aaah I DO love a bit of something edible in the garden!! 🙂 We’ve started buying tumbling tomato plants and putting them in hanging baskets! 🙂 Not only do you get LOTS of fruit — they look pretty too — and because they’re in a basket, up high, they’re a great space saving tip for small gardens!